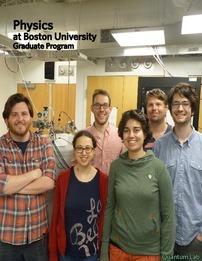 The Physics Department offers a PhD in Physics with an optional MA degree. Our research specialties include experimental particle physics, particle astrophysics, theoretical particle physics and cosmology, molecular biophysics, experimental biophysics, experimental condensed matter physics, theoretical quantum condensed matter physics, statistical physics, polymer physics and computational physics. There are numerous interdisciplinary opportunities, particularly with the School of Engineering and the Center for Photonics Research. Major resources include the Scientific Instrument Facility, the Electronics Design Facility, and the supercomputer clusters in the Center for Computational Science. We have approximately 100 graduate students, with a typical incoming class of 15-25 students. The department provides full tuition scholarships, stipends, and student medical insurance for essentially all graduate students through a combination of teaching fellowships, research assistantships and university fellowships. The Physics Department is centrally located on Boston University's main Charles River Campus. Boston is a major metropolitan center of cultural, scholarly, scientific and technological activity. There are many major academic institutions in the area, providing students an array of opportunities with which to supplement their education at BU. What do current graduate students think of studying at Boston Univeristy? Click Here to find out!